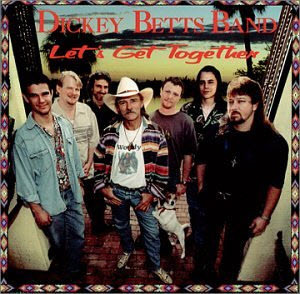 Let’s Get Together is a good-time, swinging, blues and New Orleans R&B-drenched romp through the roots of American music. From the Elmore James/Johnny Otis-inspired R&B of “Rave On” (not the Buddy Holly tune) that opens the album, Betts plays it loud and proud, blasting from the rafters with his own Les Paul and employing a second one via Mark May. Stinging his way through the raucous choruses, Betts reveals he’s lost none of his fire nor his impeccable taste as he slips jazz chords, rock pyrotechnics, and shimmering Chicago blues lines into the mix, driving a band whose Hammond B-3 and saxophone punch (courtesy of Matt Zeiner and Kris Jensen, respectively) is fierce. The title track is a throwaway lyrically, but musically it stomps the tar out of anything Brian Setzer tries to accomplish with raw American swing. Betts churns up the tempo and the volume and leaves the production out of the track, preferring an edgy, slippery groove. Betts also proves he can still write a gorgeous country song in “Tombstone Eyes,” with its shimmering acoustic guitars and B-3 crescendos. The balladry is simple but the emotion is complex. Betts‘ voice may have lost its sheeny country whine, but he more than makes up for it with sheer guts. Given its tune, lyric, and instrumentation, there is no reason country program directors shouldn’t be playing the hell out of this one. On “One Stop Be-Bop,” Betts showcases his immense knowledge of American musical forms as this ten-minute instrumental courses through bop, gypsy swing, Brazilian samba, rock, blues, country, and jazz fusion, all of it done with taste and aplomb;Betts is too much of a musician to have to show off, and he has nothing whatsoever to prove — though it’s true no one could have guessed he was such a fine arranger. The only drawback tracks — and they wouldn’t be if they weren’t juxtaposed with Betts‘ own wonderful songs — are those written by his sidemen. But here again, if Betts has erred — and this is personal taste reflected here after all — he has erred on the side of democracy in his band, and he can hardly be faulted for it. The album closes with the blazing rocker “Sing While I’m Walkin’.” Using a Wilbert Harrison riff (from “Let’s Get Together” no less! ), Betts takes it out with a stomping rouser that uses the I-IV-V progression in inverted fashion and good-times it to death with a slippery backbeat and crunchy rhythm guitar as he slashes the very air with his solo. Though he hasn’t done any solo records in a while, this cannot be considered Dickey Betts‘ comeback; he’s simply stepped out on his own again and, in sharp contrast to other acts that are usually more than the sum of their parts, as a result of his split with the Allmans, listeners now have two fine acts to take pleasure in instead of just one.